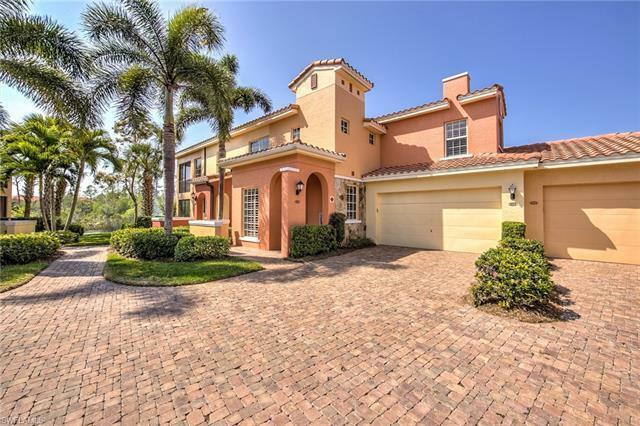 8575 Via Lungomare Cir #201, Estero, FL.| MLS# 218054449 | Southwest Florida Residential Real Estate for Sale. PRISTINE 2nd floor, end unit, RIO MAGGIORE plan offers nearly 2600 square feet plus 2-car garage. Original owners have only used the property a few months each year. Enjoy southern exposure with private lake, fountains & boardwalk and wildlife preserve views. Kitchen boasts stainless steel appliances, (new refrigerator in 2017), quartz counter tops and staggered cabinetry finished with crown molding, plus Butler's Pantry. The home has spectacular Double Crown Molding, 10 ft ceilings, tile in living areas, plantation shutters and designer custom window treatments. The spacious 17' x 15' 3rd bedroom/Bonus Room can alternatively be used as a multi-functional room. Rapallo is ideal for the Social and Active lifestyle, offering an Amenity-rich facility featuring clubhouse, Olympic pool, 2 Lap pools, Health and Fitness center, 5 Hydrogrid Har-Tru tennis courts, tournament Bocce courts, aerobics, yoga, walking and biking paths, Boardwalk, parks and walking distance to over 1 Million square feet of Coconut Point Mall -abundant shopping, dining and movie theater. New Hospital and Medical centers nearby...Minutes to RSW, Gulfcoast and Miromar Outlet Mall...Best value @ $164/square foot!